Sprinkler Design, Installation, Repair & More! 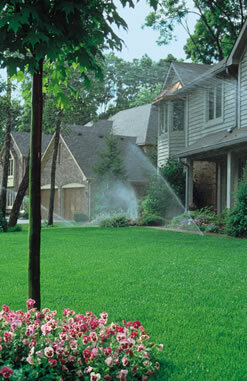 Irrigation Tech is an automatic lawn sprinkler company located in Rochester, NY. We design, install and service systems of every size from a residential front yard to an 18 hole golf course. We primarily work in Monroe County and the Finger Lakes region. We have been in business for over 35 years and currently service over 1800 customers. We have one installation crew and seven service trucks. Each service truck is fully stocked with irrigation equipment and diagnostic tools for troubleshooting. The service trucks are also all connected to the office with laptops and broadband cards for “Real time” communication with our office manager. Watch as we install pipe and sprinkler heads for a lawn sprinkler system. See how a vibratory plow puts the pipe under ground and does almost no damage to the lawn.